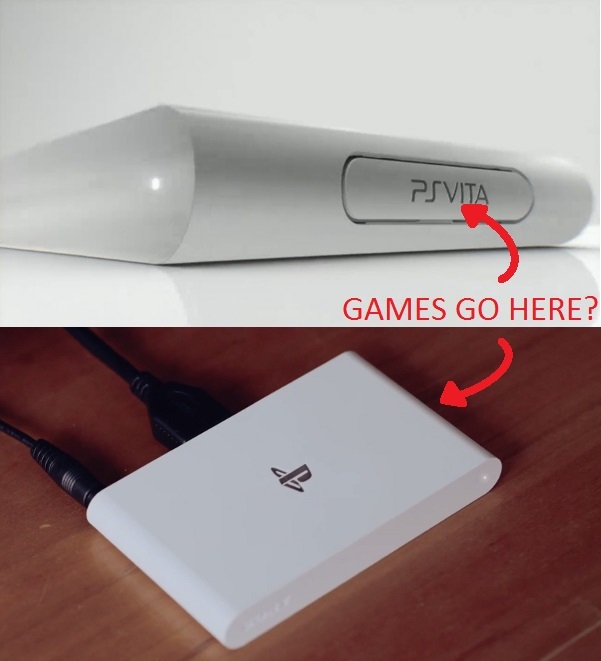 While I get the direction they are going with the PS Vita TV, I feel like they should have just built it into the PS4. Even it if was like… emulator software and you stuck the games in on the side, that would have been fine. While making this comic, Nickwood and I were sharing our impressions regarding Sony’s new hardware. “Impressions” may not be the best word here… “dissapointments” sounds like a better fit. Sony is in the best position to make me love them. I have a PS4 preordered and would really like to have a Vita. Not for the games, mind you, but for the hardware. I remember when the PS3 and PSP were coming out. Sony touted “Remote Play” as a way to play PS3 games on a handheld system. WEWT! Too bad Lair was the only game that ever worked…and it sucked. So here I am. I look at the PS4 lineup and find myself disinterested. I look at the Vita library… but I can’t seem to find it… are there any games for the Vita? You get my point. Introducing the PS Vita TV! Now you can imagine what it would be like to play Vita games on your TV! Did you see? You have the option to get your PS Vita TV with a PS3 controller! Even better? It’s $10 more expensive than buying a Vita TV and Dualshock 3 from Amazon. I’m sure it will make sense when they market it as a PS Vita TV controller which is backward compatible. How many game systems do you have that load games in on the side? I understand why the PS4 can’t play PS3 games. The hardware would be HUGE. Sony could have easily made me a Vita player by incorporating this Pop-tart sized console into my PS4. With an announcement of that magnitude, it would be difficult not to be excited for the next generation. Instead, Sony is asking me to use three of my precious HDMI slots to accommodate their consoles. Time to buy an HDMI switch. The other way to think of this though is that it’s like purchasing a second PS4 for only $100. It will still be able to stream the PS4 just like the PS Vita, so if you want to play upstairs without having to disconnect everything to play on another TV you have this little gizmo. Also if you didn’t like the Vita itself but wanted to play a handful of the games that it has released, you can. Just a thought. Good call, Brent. As long as it works (remember, this is not the first time Sony has promised me Remote Play) I am totally exited for the hardware. If this wasn’t a I may have included more constructive criticism. It looks to me like the device itself was made to be a PS4 streaming box but the marketing team didn’t get the memo. Instead, it’s being marketed as a system no one wants that plugs into a TV… whoopty do. http://en.wikipedia.org/wiki/List_of_PlayStation_Vita_games is already compiling a list of games that will not support the Vita TV. So to recap: Marketed as a system you don’t want, that plays on your TV, which has a limited library, but can’t play all existing games. Don’t forget that you have to physically move the console to swap your physical games.